Years ago I was the President of the Port Jefferson Station / Terryville Civic Association. During my time as an officer, our organization functioned beyond its primary function of being a community watchdog. Myself, Bill Theis and Jacki Kirsch – our officers, worked to bring the community together, to collaborate with everyone, and to bring awareness of things that we should know so we could protect our quality of life. Community collaboration 365 days a year is the vision behind the Time to Play Foundation, a not for profit organization’s Enjoy Life Community™ program. The only difficulty to implement the program in any community is the need to introduce the easy to implement protocol that has been created by the Foundation. A little history and why I know we can make this work: Years ago, as an officer of the Civic, I had heard about two ladies in a neighboring town that started a program called “Violence Prevention Week”. This was way before “Bullying” became the everyday term and the huge money-maker it has become in our society today. As I wrote in my book, If I Knew Then What I Know Now, our society teaches bullying. Just look at our political races, for an example. But, that’s another topic for another day. For Violence Prevention Week, our then Civic Association brought together the ENTIRE community to pull this off. We involved the girl scouts – they made hundreds of purple bows out of ribbon and put them on pins out for people to wear for a visual reminder of the concept that we should be nice to each other. The ribbons, funded by the Civic, were distributed for free everywhere throughout our community. The boy scouts tied large purple ribbons that were given to people to put on their mailboxes. Also with their help, large purple bows were tied to telephone poles and trees around our schools and down our main road in our community. Our fire department got involved. Our school district held an essay contest for middle and high school students and a poster contest for elementary students with the topic of the importance of being nice to each other. Our chamber and religious organizations were involved, and a local bank donated bonds to the winners chosen from the submission of the essays and posters. It was an entire community event – a feel good event to bring awareness of how important it was to care about each other – and people felt pride. There’s so much evidence that communities can work together as a whole. So many communities came together in a big way after 9/11. We also hear about how communities pull together in crisis. These are amazing examples of effort and the power of a community, but, unfortunately, the collaboration motivated by crisis end quickly after the crisis is over, and people go back to the way things were before. But, the Enjoy Life Community™ concept is sustainable and here for the long haul. Recently, under our preliminary efforts in Port Jefferson Station / Terryville, the Enjoy Life Community™ came together to start a walking group, helped at the high school graduation, and did a community clean up. Not just one group was involved, but people from the civic, the churches, the chamber, the school district, and more — people in our community helping other people in our community. What is the takeaway of the Enjoy Life Community™? A feeling of belonging and a sense of community: A group of people who not only live in the same area, but, together, enhance the quality of life for us all, and, further, an opportunity for us to be a part of something bigger than ourselves, to become involved, and to be less lonely. The Enjoy Life Community™ concept is timely and needed in today’s society. Unfortunately, if we look at what’s happening to our people, we see more and more despair. 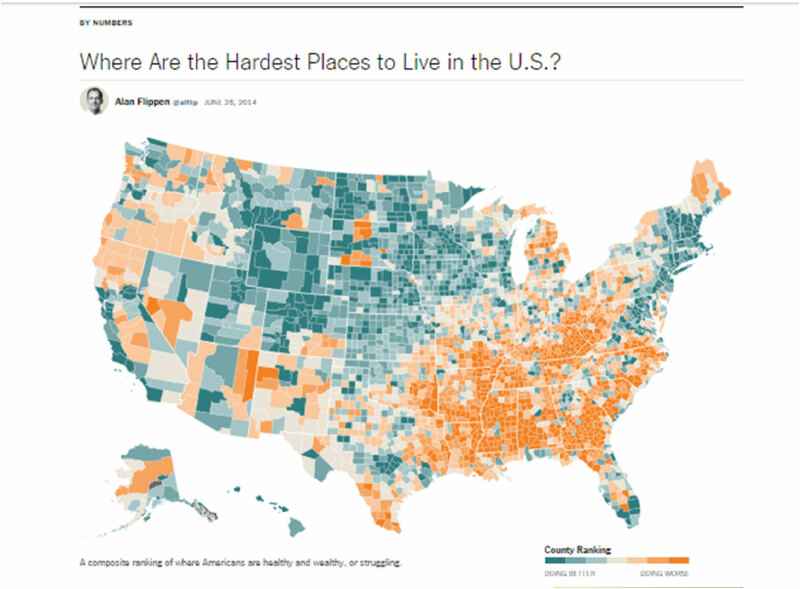 In a recent NY Times article, Where Are The Hardest Places to Live in the U.S., the reporter provided a snapshot of our Country looking at six data points for each county in the United States: education, median household income, unemployment rate, disability rate, life expectance and obesity. I included the very telling image they included in this article. The dark blue shows areas “doing better”. The orange shows areas “doing worse”. You may notice that there’s not much dark blue in the image. What hits me the most is that I live on Long Island, one of the areas designated as “doing better”. Long Island has recently been identified as THE most expensive place to live in the United States and a place where 1 in 35 homes are in foreclosure. If that’s doing better, I’m really glad to not live in the area “doing worse”. It is my opinion that every community would benefit from the becoming an Enjoy Life Community™. Further, it may be fair to suggest that as life has become more and more busy, people continue to become more socially isolated, resulting in a decrease of quality of life and increase of depression. There are many supporting articles and programs that show how more and more money is being put into recovery programs and to create medications to help people in despair. We can almost wonder if this is the right order for us to follow vs. a more active approach for PREvention vs. the reinvention and recovery approach that seems to be commonplace. I’ve been reading a book entitled, Flourish, by Martin E.P. Seligman, a Professor of Psychology at the University of Pennsylvania who works on positive psychology, learned helplessness, depression, and optimism. On page 28 he discussed the system of our government’s measurement of success – the measurement of money and gross domestic product, and the fact that the success of government is quantified by how much it built wealth. Dr. Seligman’s discussion is in support of the measurement of the community’s opportunity to flourish – to have wellbeing – instead of just measuring wealth. This is the intention of the Enjoy Life Community™: For people to not only have money, which can be created by the community working together, but to have wellbeing, to enjoy life, and to have quality of life. Working together as a community to create an Enjoy Life Community™ is a win-win for everyone. It has the ability to bring the members of the community together, decrease social isolation, encourage participation, increase property values, create collaboration, and create wellbeing. It is a focus on the positive and the possibilities. WHAT A TRAVEL AGENT CAN DO FOR YOU!